Compounds in the Na3V2O2x(PO4)2F3-2x family have shown promise to be used in the next generation of batteries, as positive electrodes in rechargeable sodium-ion batteries. Yes, this is correct, researchers are feverishly trying to find out whether we can replace lithium-ion batteries with sodium-ion batteries. Why? The major reason is that sodium is much cheaper than lithium. However, a number of challenges in moving from lithium to sodium exist, one of the biggest is size – for a bigger charge carrier like sodium one needs a bigger tunnel, channel or hole. This is where the sodium vanadium fluorophosphates come into play. 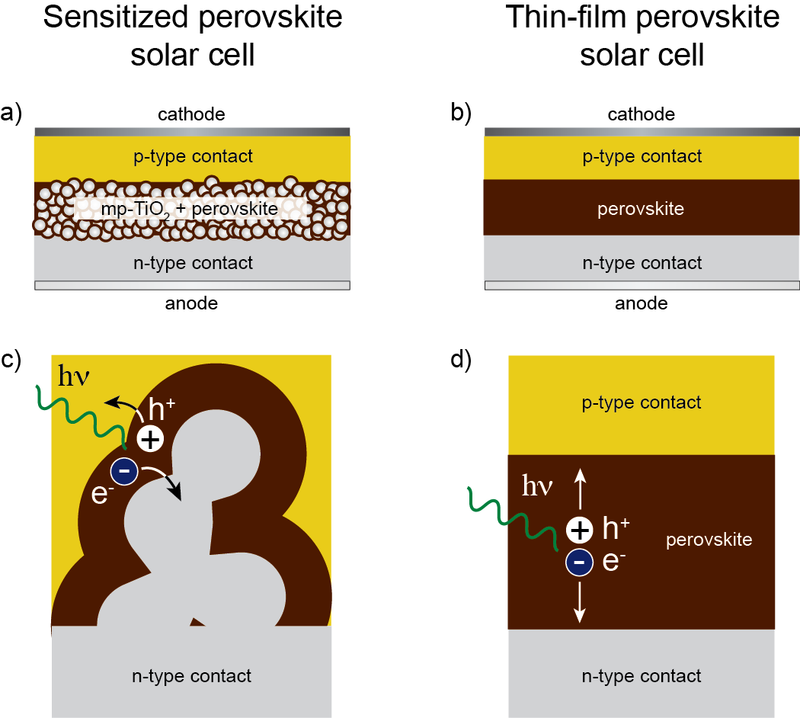 They have two sites which can host sodium and they have been shown to provide similar energy storage capabilities to lithium-ion battery positive electrodes in idealised systems. The challenges are to make a real system and test these materials for extended periods of time. Although, the sodium vanadium fluorophosphates may have a fancy application, these materials are actually synthetically and crystallographically fascinating! Synthetically because there are difficult to make and it is often the carbon content in the reagent mix that promotes formation with minimal impurities and some semblance of vanadium oxidation state control. Wait what? Carbon, there is no carbon in the formula? Well carbon appears to influence the hydrothermal reaction to an extent and its role is still unclear. 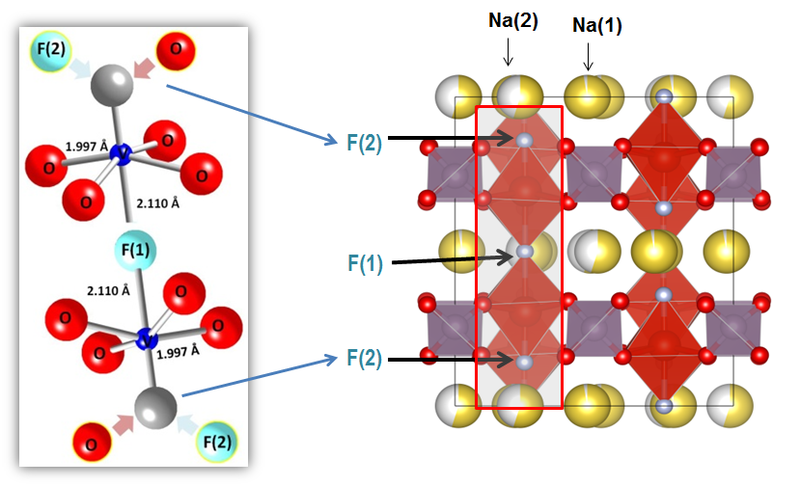 What is more interesting is the vanadium oxidation state and the ratio of F:O in the structure… F and O are very hard to differentiate using X-ray or neutron diffraction, a crystallographers nightmare, but one can use bond length analysis, 23Na & 19F NMR, double titration, and XANESto figure out the ratio of F:O and then model this in diffraction data. Additionally, the ratio of F–:O2- tells us about the oxidation state of vanadium which is often mixed valent ranging from 3+ to 4+. To add further complexity to the situation there are four known polymorphs of this material and two of them can be present under ambient (room temperature and pressure) conditions. It is a challenging material to work with but if it can be used to realise sodium-ion batteries, the challenges are worth overcoming. The original work on this system is likely to be the work of Le Meins et al. in 1999 (J.-M. Le Meins et al., J. Solid State Chem., 1999, 148, 260. ), but the work of Tsirlin et al. in 2011 (A.A. Tsirlin et al., Phys. Rev. B 2011, 84, 014429.) and our work in Serras et al in 2014 (DOI: 10.1039/c4ta00773e) address a number of pertinent issues that were concerning in the literature. We use in situ synchrotron X-ray diffraction to illustrate the structural evolution of this positive electrode in a sodium-ion cell. Protein crystals naturally occurring in a cellular membrane: Bacteriorhodopsin. On the left: an electron micrograph of the naturally occurring two-dimensional crystal of the protein, taken directly from cellular membrane (Unwin & Henderson 1975). Dark ‘blobs’ are the protein (bacteriorhodopsin), in between are lipids. 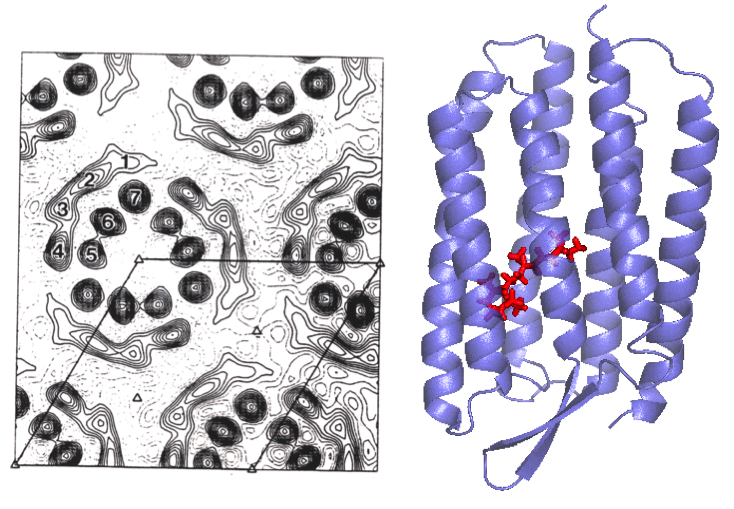 On the right is one of the more recent crystal structures of bactiorhodopsin (Belrhali et al. 1999), PDB entry 1QHJ (Figure made with Pymol). The ‘blobs’ in the micrograph are helices viewed from above – these helices can be seen in the transmembrane view in the structure on the right. Bacteriorodopsin is one of life’s amazing little energy machines: a photosensitive molecule in the middle of the protein takes energy from the sun and uses it to pump protons across the cell membrane. Membrane proteins are notoriously hard to study, but nature at least gave us one gift in this regard: a protein that naturally forms a two-dimensional crystal structure in a membrane – bacteriorhodopsin. Because it could be purified directly in a crystalline form, bacteriorhodopsin was one of the first membrane proteins to be studied structurally in great detail by a variety of techniques including electron microscopy and neutron diffraction. Many stages of the machine’s ‘pumping’ action (intermediate structures) have now been resolved by X-ray crystallography, making this a great example of how structures don’t just give us pretty pictures – they show us how life’s little machines work. Bacteriorhodopsin has been extensively studied by too many groups to cite, who all contributed to understanding its mechanics. The image of the 2-D crystal on the left is from one of the very early electron microscopy studies, the structure on the right is from 3-D crystals of the protein grown with lipids. Henderson R, Unwin PN (1975) Three-dimensional model of purple membrane obtained by electron microscopy. Nature, 4; 257:28-32. Belrhali H, Nollert P, Royant A, Menzel C, Rosenbusch JP, Landau EM, Pebay-Peyroula E (1999) Protein, lipid and water organization in bacteriorhodopsin crystals: a molecular view of the purple membrane at 1.9A resolution. Structure, 7, 909-917. The crystal structure of the photosynthetic reaction centre from the purple bacterium Rhodopseudomonas viridis. In 1985 Johann Deisenhofer and colleagues successfully solved the first membrane protein structure to atomic resolution by X-ray crystallography . The protein complex shown is the photosynthetic reaction centre from the purple bacterium Rhodopseudomonas viridis and for solving this structure Johann Deisenhofer and Harmut Michel won the 1988 Nobel Prize in chemistry . Some bacteria, like plants, can perform photosynthesis, the process of acquiring energy from light. The photosynthetic reaction centre is the membrane protein complex in the R. viridis membrane that captures the light energy needed for photosynthesis to occur and converts it to chemical energy. 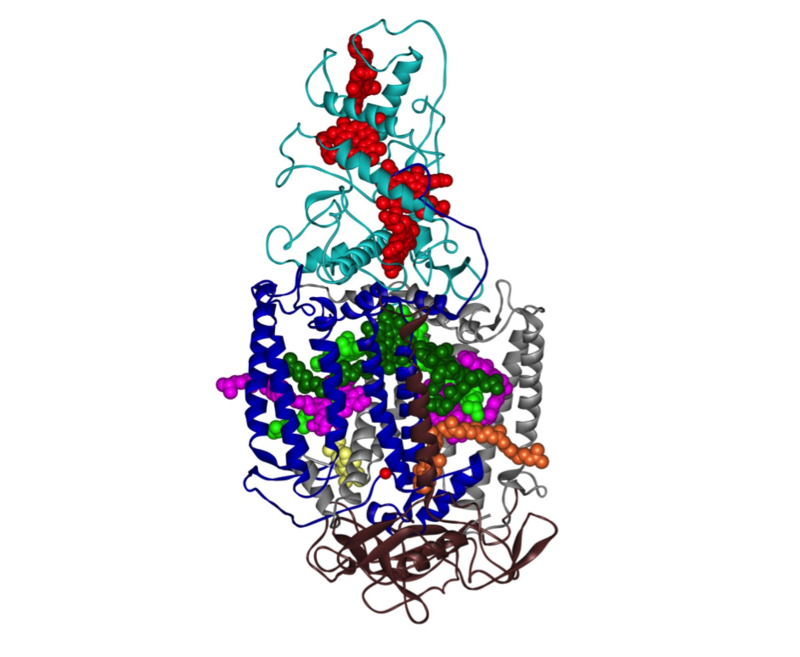 The photosynthetic reaction centre consists of four protein subunits called heavy (brown ribbons), medium (blue ribbons), light (grey ribbons) and cytochrome (cyan ribbons). The long helices in the heavy and medium subunits are the parts of the protein that reside in the core of the cell membrane. There are also a number of co-factors: four bacterio-chlorophyll molecules (light and dark green spheres), two bacterio-pheophytins (pink spheres), one non-haem iron atom (single red ball), two quinones (QA (orange spheres) and QB (yellow spheres)) and four haem groups (red spheres). When a photon of light is absorbed by a pair of bacterio-chlorophylls, the pair goes into an excited state and loses an electron which is passed to the bacterio-pheophytins in the super quick time of 3 pico-seconds. The electron is then passed to QA and then to QB via the non-haem iron. At this point the QB will leave the complex and establish a gradient of protons across the bacterial membrane which will then be used by other proteins to generate the cells energy currency, a molecule called ATP. The pair of bacterio-chlorophyll at the start of this cycle gets replenished with electrons from the haem groups in the cytochrome domain so that they return to the ground state from their excited state. The system is now reset and the whole cycle of passing electrons around can start again with the next photon of light. J. Deisenhofer, O. Epp, K. Miki, R. Huber, H. Michel: Structure of the protein subunits in the photosynthetic reaction centre of Rhodopseudomonas viridis at 3 Å resolution. Nature 1985, 318: 618-624. J. Deisenhofer, H. Michel: Nobel Lecture: The photosynthetic reaction centre from the purple bacterium Rhodopseudomonas viridis. EMBO J. 1989, 8: 2149-2170. J. Deisenhofer, O. Epp, I. Sinning, H. Michel: Crystallographic refinement at 2.3 Å resolution and refined model of the photosynthetic reaction centre from Rhodopseudomonas viridis. J. Mol. Biol. 1992, 246: 429-457. The crystal structure rainbow – Indigo in your batteries? The indigo carmine structure found by Yao et al. Image take from thier paper. This molecule is colourful, and perhaps an answer to humankind’s energy storage issues? Indigo carmine (or 5,5′-indigodisulfonic acid sodium salt) already has a number of uses because of its colour. This molecule can be used as an indicator of acidity. It also has medical uses, often being used to investigate how a urinary tract is working. It turns your pee indigo blue and can easily be broken down by your kidneys. But some investigators have looked into the possibility of it being used as a battery material. 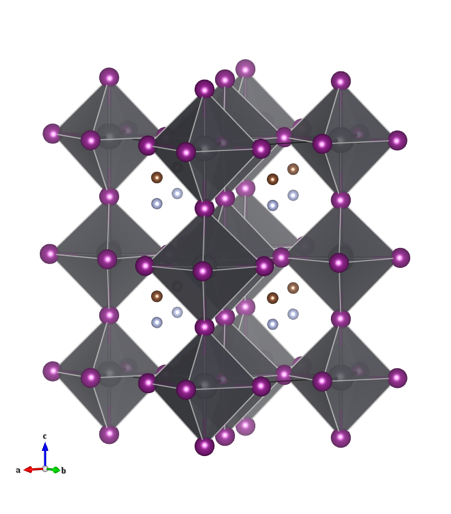 This is because of the sodium ion in the structure (in the picture above these are purple). Much of the focus on increasing the effectiveness of batteries is investigating lithium ion batteries, but there’s an issue in that there’s only so much lithium the world has to offer. There’s a lot more sodium available, but it’s difficult to use as a battery material because the sodium atoms are quite a bit bigger than lithium ones (and you need them to be able to flow past the rest of the material in the electrode). Electrode materials (those that store up the charge in batteries) are often made out of inorganic materials, which are themselves quite big atoms. The difficulties is finding an electrode that can reproducible give away it’s sodium to generate charge, but then take it back to store up energy again. Could an electrode be made out of a smaller, organic material? 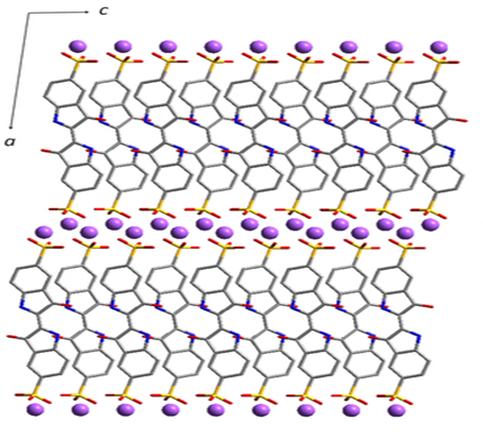 These Japanese researchers investigated the potential that indigo carmine has as a battery material, and monitored how the structure changed as it was charged up and as the energy was used. As they were preparing the same they saw that the structure had changed, and this new structure had lots of ‘potential’ as an electrode material. Octahedral sites are occupied randomly by lithium (1/6) (not shown in image) and titanium (5/6) atoms. Ti atoms are blue, Li atoms green and O atoms are red. Lithium titanate has a spinel-type structure and is a promising anode candidate for long-life lithium-ion batteries. Current lithium-ion batteries use carbons, such as graphite, but these can feature safety issues when the battery is charged or used rapidly. Li4Ti5O12 is much safer to use at these rapid rates and only features minor structural changes (e.g. expansion/contraction) during battery function. Therefore, it is said to have excellent cyclability andlong term stability at a high capacity. 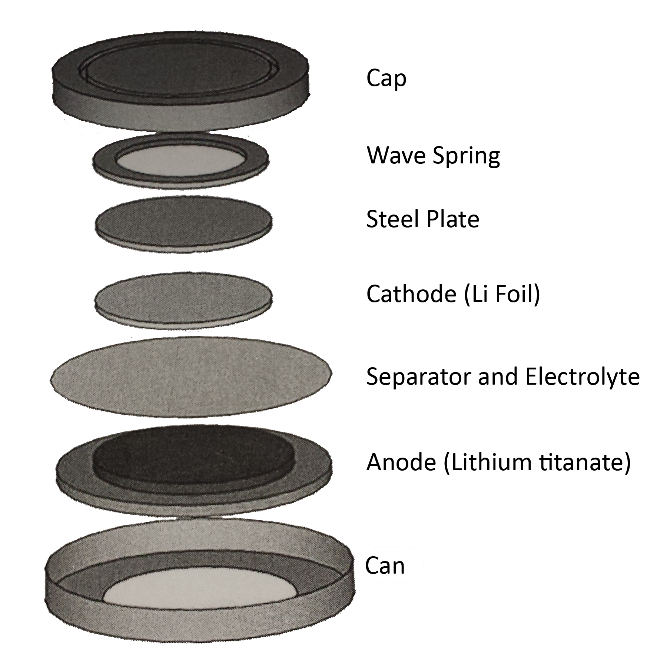 To the right is a schematic of a coin cell as can be constructed with lithium titanate as an anode material. A rechargeable battery features chemical reactions that are approximately reversible with charge and use. A lithium-ion battery is rechargeable and relies on the transfer of lithium from the cathode to the anode during charge using electrical current and the reverse during use where it produces electrical current. It is found in many consumer portable electronic devices such mobile phones, computing and entertainment devices. The lithium-ion battery industry is estimated to be worth $USD11.70 billion in 2012 and is forecast to reach $USD33.11 billion by 2019. Cystallographic information on lithium titanate can be obtained from #4000741 in the open crystallography database.